You can pay by check, credit card or click here to use PAYPAL (with Friends and Family option) and send payment to info@hilltopfarms.org. To use a credit card please call Fred at 919 618-5601. Raleigh Thursdays: 3:30 box drop-off The Raleigh Wineshop, 126 S. Glenwood Ave.
Raleigh Thursdays: 4:00 box drop-off Harmony Farms, 5653 Creedmore Rd. Holly Springs Thursdays: 5:00 box drop-off Bombshell Beer Co., 120 Quantum Dr.
·	A Full Share Membership includes a weekly box of produce that you pick up at the farm on either Tuesday or Saturday or at the Raleigh/Cary/Holly Springs area dropsites. Half Share Members get the same amount of produce each week but choose10 weeks during the season to pick-up their shares. ·	Work share members also receive the same amount of produce as Full or Half share members except at a discounted price in exchange for 6 hours work on the farm sometime during the season. Must be at least 16 years of age to work. 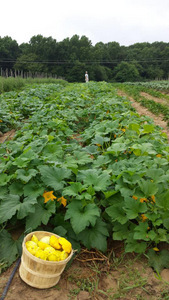 ·	Members fill their own boxes from the variety of produce available each week at the farm. Members receive a pre-packaged box of produce at the Raleigh/Cary/Holly Springs area dropsites. The farm will fill boxes with an alternating selection of products to offer variety. ·	Members receive an average of $25 worth of organic produce each week, although some weeks may be larger than others. We ask that members designate a dropsite on the form to pick-up their weekly share for the season but they can opt to come out and see the farm any week and pick-up their share then. ·	Members can also have someone else pick up their share for them at their designated dropsites if need be and even pick up at the farm to make up for a missed week. This allows for vacations and such without forfeiting a week of produce. Members assume the risk and bounty that nature provides!